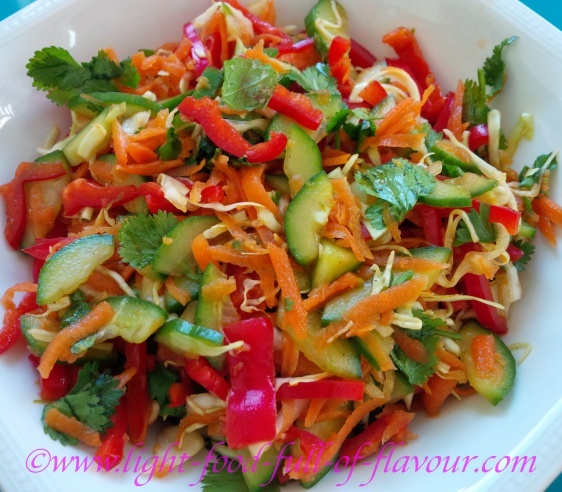 I made this crunchy Thai salad today for a friend from the Philippines and she immediately asked for the recipe. Luckily I had written down everything I used in both the dressing and the salad as I wanted to add it to this website. If I am not going to write about it, I tend to just add things as I go along. I keep on tasting and adding until I am satisfied. I am adding sesame oil to the dressing - a really tasty and mild sesame oil though. Until recently, I have only come across sesame oils with a very strong taste and a tendency to take over the whole show. The kind of sesame oil you mostly find in a supermarket. I suppose it is with sesame oils as with everything else – like with wine and olive oils for example - there are your less expensive varieties and those with a bit more refinement. The one I am using now is an organic, unrefined, first cold pressing sesame oil. Sounds expensive, doesn’t it - a bit posh? But it is less expensive than any olive oil I have ever bought. And the taste is sublime. Look out for this kind of sesame oil in delicatessens, health food shops or shops specialising in Asian food. I am using a tablespoon of this mild sesame oil. If you have got sesame oil with a very strong taste, you might be better off just using one teaspoon of this and adding a tablespoon of coconut oil or vegetable oil as well to the dressing. Mix together all the ingredients for the dressing. Add the salad ingredients to a large bowl and pour over the dressing. Mix the salad well and allow it to rest for at least 30 minutes - the flavours will intensify if you leave it for longer. Toss before serving.